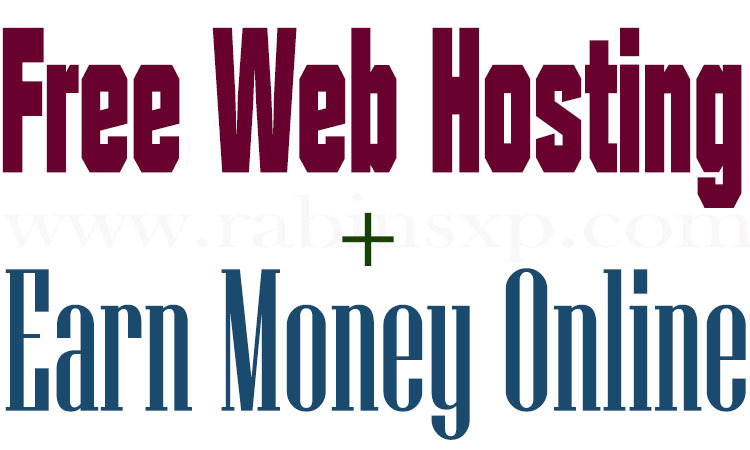 There are plenty of web host all around the world from free to paid or free shared to premium. I want to introduce with one of the Web Hosting Providers which gives free Web Hosting (100% free) for a lifetime and ways to earn money using the same hosting platform. I have checked it myself, worked with this web hosting. So, I just wanted to share with you. There are tho reasons behind me for sharing this piece of information. Number one, this web hosting provider really is reliable than others and by referring you, I will also get some bonus points that I will later use in upgrading services or something like that. From this website, we can get two types of benefits. Like I already said, you can host your website (or blog) for free and when you join referral programme you can get some rewards in return. Number two, this is a reliable web hosting provider, it’s customer support is good. Don’t expect too much like that of Godaddy also. But then also, it’s good comparing to other hosting providers especially that one who provide free services. “Free Web Hosting Service” provided by this Hosting Provider is perfect for different types of small websites, such as personal, community, forums, and blogs. As they say, they are proud that more than 90% of our customers are fully satisfied with our free web hosting plan and never reach any limits! However, if you have a large or very busy website and need guarantees for uptime and daily backups, check out their Premium and Business hosting plans. Talking about “Premium Web Hosting”, you can enjoy the best possible hosting service, without restrictions, for an extremely low price. This Premium hosting plan is unlimited and comes with free domain name registration! In addition, it comes with a much higher CPU limit and no connection limits. Premium servers are also much faster and more powerful. The Premium hosting service includes automated weekly backups and a 30-day money back guarantee. They also provide “Business Web Hosting”, this plan is recommended for companies and busy website owners. It has all the best features from our Premium hosting plan and also includes e-commerce features such as free SSL certificate for the first year, InnoDB support, and unrestricted SSH access. With a Business hosting plan, you also get automated daily backups and a 60-day money back guarantee! Now let us compare these three types of Hosting plans: Free Web Hosting, Premium Web Hosting and Business Web Hosting. After you open an account, you can find a list of targets that you can reach by referring a certain amount of active clients. Once you have reached enough active referrals a “Request” button will appear and you will be able to request us to send you a selected gift, activate free service or send you a payment. 3 referrals will get you premium unlimited hosting for free. 5 referrals to Earn 290 INR. 15 referrals will get you a free .com domain registration. 100 referrals will earn 5800 INR. And I was talking about Hostinger and it’s easy building a website for a newbie like 123 because it has got a Website Builder tool which will help you create a website in 5 minutes and Software auto-installer allows to install over 100 PHP applications. There are no any hidden fees in free services. In addition, you can tell your friends about Hostinger and earn money or premium hosting. It is a special referral link unlike any others because when you signup using this link you would get more Goals to complete and I will also get my few goals. You will later notice the Goals in your referral sections. So this makes this referral link unique than other referrals.